Tooth implant cost really boils down to how much time the dentist is going to need to do the whole job from start to finish. The time the dentist needs to do the WHOLE job is the biggest single factor. More complicated cases will take more time than simpler cases. Much more time. A single dental implant can be planned, fitted, and then a tooth (cap or crown) added, all in perhaps 5 or 6 appointments. But if you need several dental implants to replace, say, 6 to 8 teeth, then the planning stages will be longer, the actual surgery to fit the implants will be longer; also the check appointments after surgery may take longer, and to finish up the final stages to get the new teeth fitted to the implants will be more time-consuming. IT ALL ADDS UP! Like all professionals, dentists charge by the hour. So more time = more cost. So how can you find affordable dental implants? It can be extremely difficult to estimate how much time (and therefore cost) accurately, because the dentist doesn't really know for sure at the start what dental implant complications might arise. Finding a dentist who offers affordable dental implants really means finding someone who is experienced, well-trained, and well-equipped. This makes him able to make accurate assessments of the degree of difficulty of a particular implant case, and budget accordingly. Fixed costs: the cost of paying his staff, rent, insurances and his own materials such as gloves, masks, and all the disposables involved. Paying for all of these adds up to quite a bit! The cost that the dentist is going to incur himself from doing the work; these are the bills he will get if he does the work for you. That means the cost of the implant itself, the cost of the laboratory work and materials. Then he has to work out what he expects to earn for himself from the case. To do this, he has to work out how much time he will need for ALL the appointments required, and then multiply the number of hours by his hourly rate. But here comes the surprising bit. Some dentists will then add on an extra amount as a "fudge factor". That means, they're not sure how things will work out, and so they add an extra amount to the quote to cover any extra treatment that may be required later on. 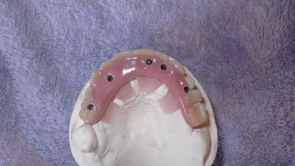 Laboratory models of a complicated dental implant case, with 5 dental implants supporting a "beam bridge". He may even assume that, in the WORST CASE, the implants will all fail and need to be done again. So he adds in the time that will be needed if he has to do that, plus the cost of another set of implants! You can imagine, that really puts the price up! If the case turns out to be straightforward and there are no complications, then he is in profit by a large amount. If things need to be re-done or the whole case just takes longer than planned, he's not out of pocket because he over estimated anyway. The cost of an actual dental implant ranges from about $100 to $250, depending on the manufacturer. But that's only a small part of the overall tooth implant cost. In a way, it's a bit like an artificial heart valve. In terms of the materials involved, it's only a few dollars. But try getting a heart valve put in for anything under a few thousand dollars! 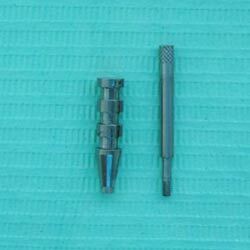 The actual implant itself is just a small part of the full surgical kit that the dentist or oral surgeon needs. Basically, he has to equip a small operating theater, with all the gadgets and gizmos needed to make implants safe and predictable. And another thing. The dentist has to keep a large stock of dental implants of different lengths, widths and shapes. It's impossible to predict exactly what size of implant will be needed in any particular case. This has to be decided at the time of implant placement. So the dentist has to have a large stock of every possible size and shape. That means an investment of anything from $10,000 to $20,000, sitting on the stock shelves. So all these things add up to make implant dentistry an expensive business. But here's another way to look at it: The major component of tooth implant cost does not lie in the actual implant; it lies in the skill and training required of the person who is going to do the job. And that person has invested thousands of hours in education and training. So trying to save a few dollars by looking for someone who uses a less expensive brand of implant may be a false economy. The difference in cost between different implants is only around $150. The biggest area where cost can be saved, making affordable dental implants a reality, is in efficiency. A dentist who has plenty of implant experience - more than 1000 implants. He will be able to assess your case more accurately and more quickly. A CT scan - this shows the exact shape and density of the jaw bone, and helps in planning, preventing surprises! Discount for multiple implants. Some offices offer a more affordable rate per implant if you are having more than 3 or 4 implants. Finance for implants. 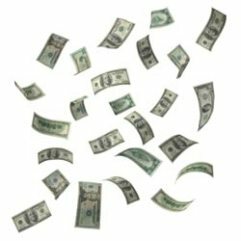 Many dental offices can offer financing over 12 months, to help spread the cost. Insurance against implant failure. You can get insurance to help cover the costs of getting a new implant if the first one fails within 12 months. This may allow the dentist to set more affordable fees for the first procedure, as he doesn't have to worry about the costs of re-doing the implant should it fail. The next big area that affects tooth implant cost is; - what goes onto the implant! As I've already pointed out elsewhere, the actual implant needs to have a tooth or teeth attached to it - and that costs money too. 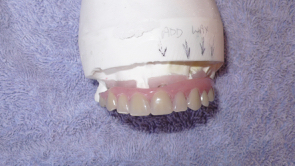 There are big cost differences between a fixed porcelain bridge and an acrylic hybrid bridge: Just about the only thing in favor of the porcelain is that close-up it can look a bit more natural, and resists staining. Otherwise, it's a lot more expensive, more fragile, and difficult to repair when something chips or breaks. Basically, the more teeth that are being replaced (ie. the bigger the bridge), the more I would lean towards an acrylic hybrid (or beam) bridge. This reduces the overall tooth implant cost, and means easier (and cheaper) maintenance.